PHILADELPHIA, Pa. — The Democratic district attorney of Philadelphia pleaded not guilty this week as he was indicted on more than 20 counts of extortion, bribery and wire fraud relating to abusing his office, including accusations that he took social security payments meant for his ailing mother’s nursing home care and used it for his own personal bills. 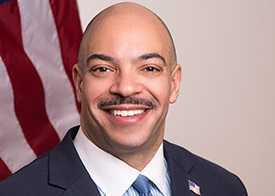 Seth Williams, 50—known for prosecuting “House of Horrors” abortionist Kermit Gosnell, who is consequently serving a life sentence behind bars—is now himself facing a 23-count indictment that spans alleged acts over a period of five years. Williams is accused of receiving $175,000 worth of gifts in exchange for helping those in legal trouble, including a trip to the Dominican Republic, a Louis Vuitton necktie, an iPad, a Burberry watch and a 1997 Jaguar. “The indictment alleges that as District Attorney, Mr. Williams compromised himself and his elected office by standing ready to help those who were willing to pay him with money, trips and cars,” acting New Jersey U.S. Attorney William Fitzpatrick said in a statement on Tuesday. Williams, who receives a $175,000 salary, described himself as “poor” and a “thankful beggar” to some who gave him gifts, and has stated that he has difficulty paying alimony following his 2011 divorce. The district attorney is also accused of taking more than $10,000 of social security and pension payments from his 84-year-old adoptive mother’s account and using it to cover his mortagage payments, as well as electrical work on his home. Williams had been fined $62,000 in January by the Philadelphia Board of Ethics for failing to report the gifted trips and goods as required, and he declined to run for re-election due to the “unnecessary shadow” the situation has cast on his office. However, he also denies any wrongdoing. “Mr. Williams vehemently denies that he ever compromised any investigation, case, or law enforcement function,” attorney Michael Diamondstein told reporters this week. Mayor Jim Kenney has asked for Williams’ resignation. As previously reported, a number of government corruption cases have been brought to light in recent years in Pennsylvania. In 2014, then-Attorney General Katherine Kane exposed widespread inappropriate and pornographic emails being shared among various state officials, resulting in the resignation of Environmental Protection Secretary Christopher Abruzzo and Board of Probation and Parole member Randy Feathers. Pennsylvania Supreme Court Justice Seamus McCaffery also stepped down after being accused of sending eight explicit emails to an employee in Kane’s office, and Justice J. Michael Eakin was suspended by the Court of Judicial Discipline over the matter. Police Commissioner Frank Noonan and Kevin Harley, former spokesperson for then-Gov. Tom Corbett, were also cited in the discovery. Nearly two dozen state employees were reprimanded and six were fired. In all, over one million emails were released to a special prosecutor for investigation. However, Kane herself was also charged with perjury in an unrelated matter and resigned amid impeachment hearings. Last June, U.S. Rep. Chaka Fattah, D-Philadelphia, submitted his resignation after a jury found him guilty of 22 counts surrounding accusations that he had misused federal grants and nonprofit funding to repay an illegal loan from his 2007 mayoral run. He is currently serving 10 years behind bars on charges of racketeering, money laundering, bribery and fraud, as well as other criminal counts.